Yup! Another day, another medal. I’m getting quite a collection now! 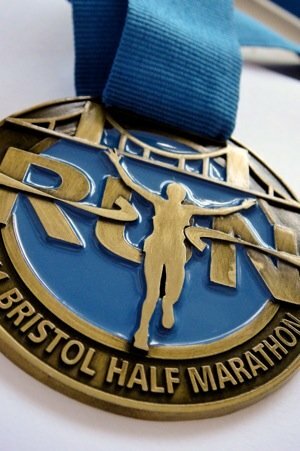 I enjoyed the Bristol Half Marathon on Sunday, despite having had some reservations about my weight and the amount of training I’d been doing. I didn’t think I stood much chance of beating my personal best from the Bath Half. At least I arrived relaxed and well‐prepared for the running. After a couple of half‐marathons and 10Ks I’ve got the preparations down quite well now, from pinning my number on to checking the weather forecast before I set out. The weather was a little too good, as it turned out. The sun was blazing away, and the Portway, which makes up the bulk of the route, is pretty exposed. Once we’d all set off from the Centre, I was glad of the few clouds there were occasionally drifting in front of the sun. I ran this one on my own — there’s another reason to speed up my running: you have more options for running partners if you have more speeds available than “dead slow”! — so I spent most of the race just enjoying the feeling of running and being part of the general crowd around me. And people‐watching, of course, especially the crazy fancy‐dressers. This race didn’t disappoint on that score, with bagpipers piping their way around, a couple of people “wearing” a boat in support of the Marines, a waddle of penguins, several dogs, and Bob the Builder, to name but a few of the sights. I also got a chance to wave to a few friends — I’d only just set out when Tom snapped me (with a proper old‐school film camera, apparently) on my way past, plus I spotted several people coming back down the Portway as I was on my way out, including Jose and other usual suspects. I kept up a very steady pace all the way around, just plodding along as usual. I felt pretty good up to somewhere around the fourteenth kilometre — that’s the way back into town along Cumberland Road — where my legs started to feel a bit dead, but even that wasn’t so bad. Trudging around the last bit of town, I was determined just to keep going, mostly because my legs seemed to have got into that fragile momentum which might have been difficult to get back into if I’d slowed down for even a second. As it turned out, I had just about enough energy to keep going right to the finish line — perked up at the last minute by my friends Emmeline and Arnaud cheering me on — and I came in at an official time of 2:48:15, breaking my previous personal best by just over a minute. Hurrah! Well done — keep it up.